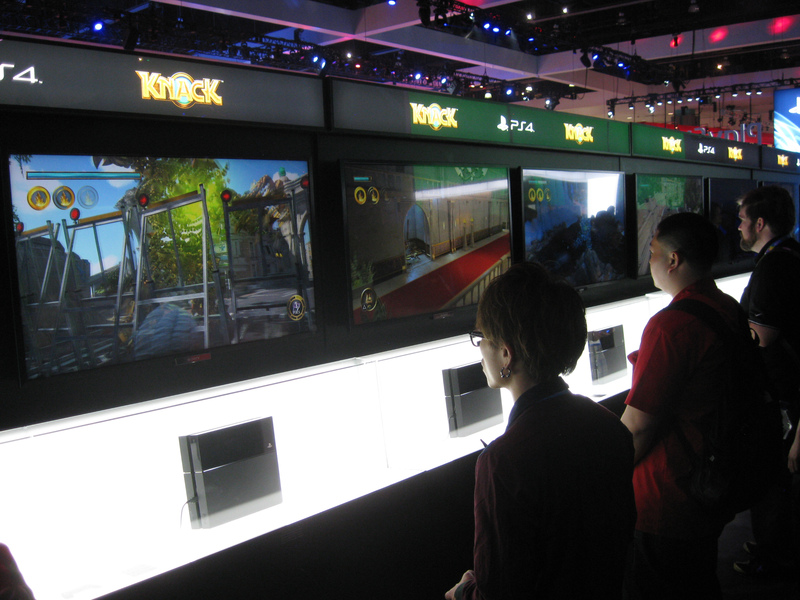 The Knack demo had four levels with the grand total playtime being about 15 to 20 minutes. The first level is normal sized Knack progressing through a city and defeating enemies. The second level shows off the stealth elements where Knack can shed his body pieces and can walk around as a shorter, transparent being with very low health. 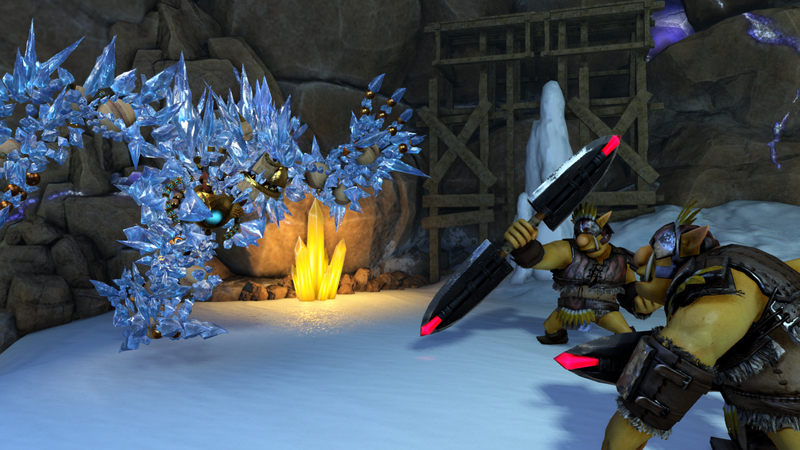 The third level showed off ice visuals where a normal sized Knack had ice armor for extra health. 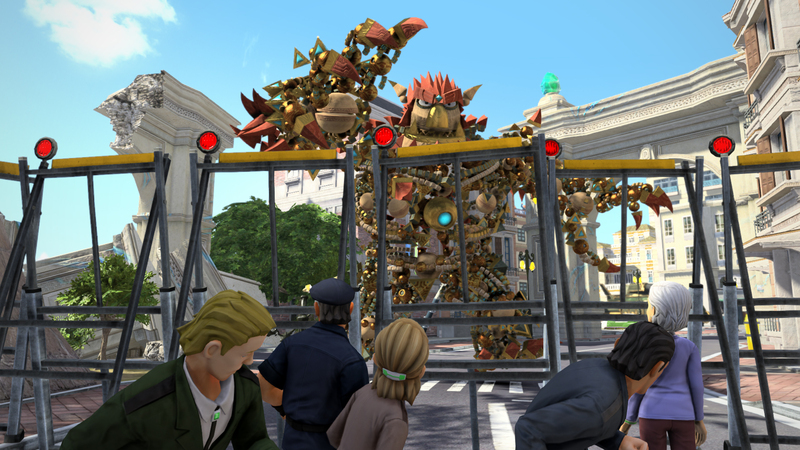 The final level allowed you to control a supersized Knack rampaging through the city. 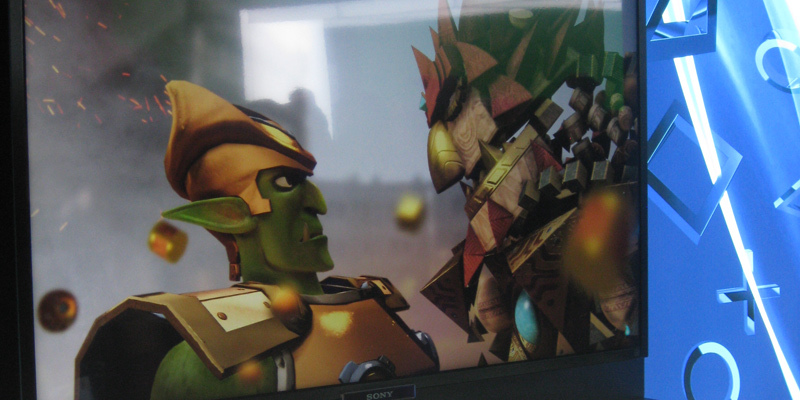 Most of the gameplay was based around Knack doing light platforming, clearing out enemy resistance and then moving on. Around the environments are destructible yellow objects that help Knack regain health and power his super meter. The game controls were extremely simple. The main control stick moves, the right stick does a dodge, X jumps, Circle grabs cars, Triangle sheds particles for stealth Knack, Square punches and super moves are two face buttons together. There was no block button and double jumping and dodging seemed to be the only way to keep Knack alive against projectiles. One of the new PS4 features: When you open up a treasure chest, you get an item and have the ability to “copy” one of your friend’s items and keep it. In the demo, there were a list of fake friends and I selected one of them to enhance my special meter. The “Share” button on the controller did nothing during the E3 demo when I pressed it. The Sony staff member said that Sony Japan Studio’s goal was to reach CGI visuals. The closest video game art style and visuals that currently are close to Knack’s is Rachet and Clank: Tools of Destruction and Sonic Unleashed (day levels). The game is visually stunning with tons of particle effects, a overflowing helping of color and smoothness. Knack is the best looking launch game I’ve seen for Playstation 4. Image what developers can do as we go even further into the game development lifecycle. While playing the demo on the second level sneaking level, the game unfortunately froze. The upside was that the Sony staff member allowed me to replay that level again and I got more hands-on time than other attendees. 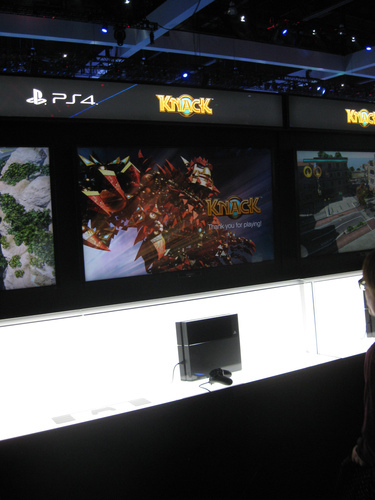 Knack is launching with the Playstation 4 later this year. While I really love the art style, visuals, cinematics and fluidity, the gameplay is a little too simple and the difficulty currently too easy for me on the “Normal” difficulty to see myself playing it seriously. Let us know which launch games you are excited for in the comments.